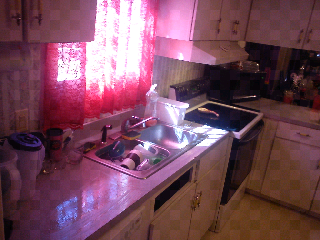 Accomplishment: 15 minutes... washed more dishes....almost there! 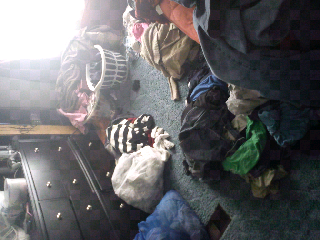 Accomplishment: 15 minutes... put laundry away! 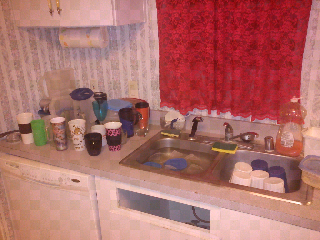 Accomplishment: 15 minutes.. put dishes away and washed more dishes! Yesterday.. (thanks to the motivation of Flylady Chat!)... I washed a sinkful of dishes, washed and dried (still need to put away) a load of laundry, swept all hard floors, towel mopped the kitchen, made dinner (taco braid), and got a little bit done for work. 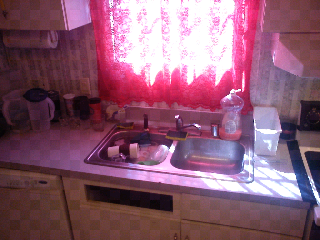 My kitchen sink... in it's current state. Accomplishment: 15 minutes... vacuumed floors. Super easy Polynesian chicken the other night. Yum! Hmm.. I wonder what I can make tonight? I ended up making flavored rice with fried spam slices for dinner.. 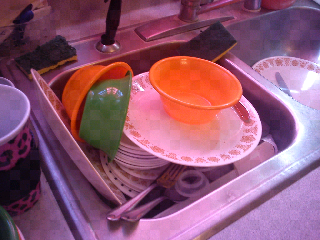 I was wanting to do dishes but I didnt get around to it. But I did one load of laundry that I am currently waiting to finish drying (just a couple more minutes) so I can put them away. 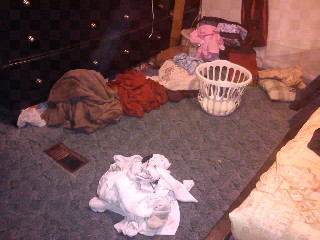 I would have been in bed already, but I had to finish the laundry that I started... compulsion. Dinner tonight: rice and red meat. The only red meat in our house right now is spam... so I will either do flavored rice with spam on the side, or fried rice with spam pieces in it. 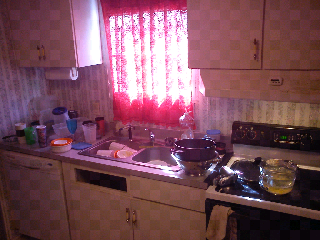 Accomplishment: 15 minutes.. hand washed another load of dishes (I only have another 3 or 4 more to go to get caught back up!) and cleaned/ filled water container in fridge. 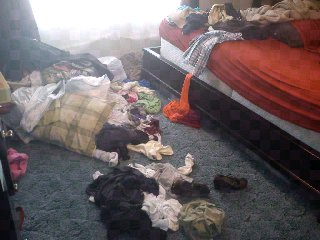 15 minutes.. put another load of laundry away! 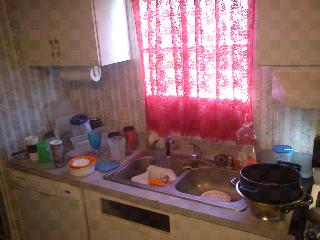 Accomplishment: 15 minutes.. Hand washed another load of dishes! 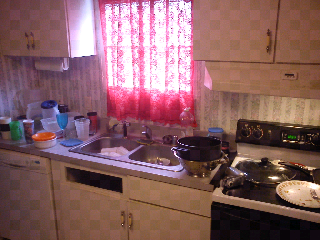 Accomplishment: 15 minutes.. swept and towel mopped kitchen and dining room. 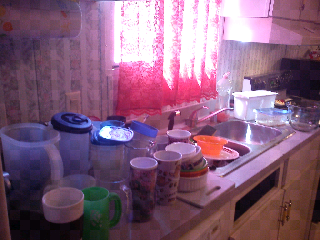 Accomplishment: 15 minutes.. hand washed one load of dishes! 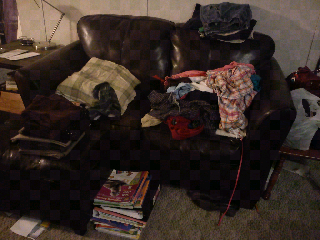 So I put on some get-up-and-move music, set the timer for 15 minutes and set out to put away this load of laundry thats been sitting on the couch for a few days now.. After ten minutes, I found myself dancing in the middle of our fairly empty dining room. Also.. I learned a new trick: Take some hangers with me when I go to empty the dryer.. take the clothes out one at a time and hang them up right then. 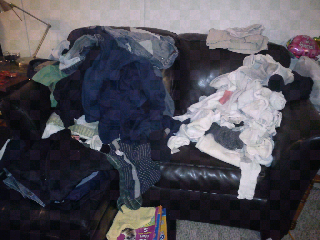 I can bring the rest of the load to the couch with me (I dont think I'll have the energy to fold them all as I'm standing in front of the dryer too)..
Accomplishment: I put one load of laundry away! Today.. 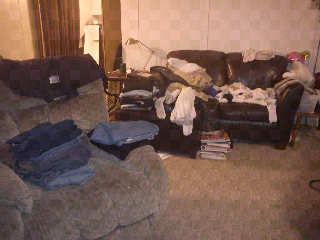 I put the rest of the Christmas stuff away. Besides the stuff that I dont feel like putting away and can't find anywhere to put it.. so it shall stay out all year round. A work in progress.. but SOME accomplishment. Not much has changed since yesterday... I think the reason I'm doing this now is just so that I will be more aware. It will make me think about it everyday if nothing else.. Hey, I gotta start somewhere... BABY steps! 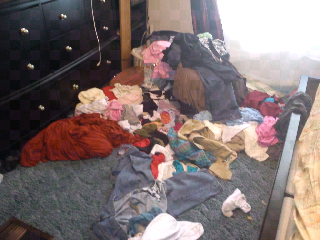 The first step is admitting that there's a problem.. This is my first time on here since I got my new phone... its been quite a few months. 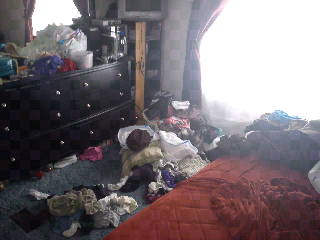 I think I clean my house about as often as I get on here though.. And I certainly havent done any cleaning lately... But I have been getting these weird urges to go out walking or jogging or something lately.. not that I've done anything about it.. I even had a small urge to start planning dinners again (actually making them is a different story..lol). Idk.. maybe a change might be coming.. or maybe not. Its a nice thought though. 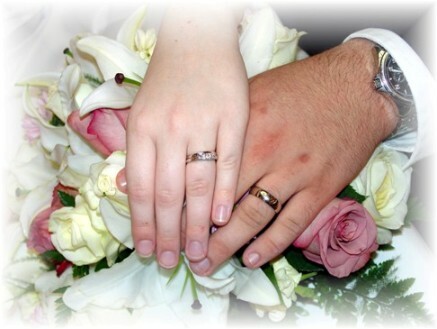 I'm just waiting for something to spark up my motivation..
DH and I have been happily married since 2005. We have no children yet. I am a homemaker. 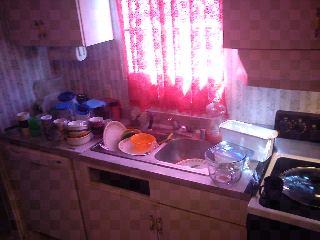 I believe that the home is my first priority whether or not I have an outside job. I believe that God sees how you handle the little things before He entrusts you with bigger things. 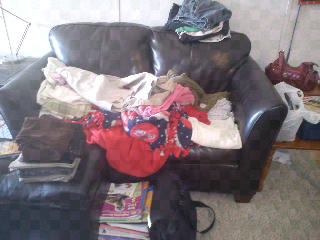 Homemaking is my daily challenge. I accept the challenge ....... Bring it! 11th Heaven's Homemaking Haven - On a Vegan Kick! Ms. Booty Homemaker Explains It All To You. 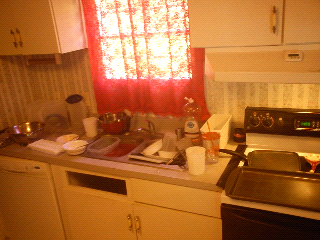 - Accomplishment: 15 minutes... washed more dishes....almost there! Summer Scavengers - We are planning to join fellow Oklahoma blogger on a summer adventure! Want to come along?